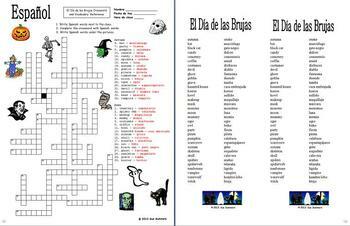 Spanish Halloween Crossword, Image IDs and Vocabulary Reference - 35 Words! There are 35 clues with words related to Halloween such as candy, witch, moon, black cat, etc.. There are also 15 clip art images to identify. Also included is a word list alphabetized English to Spanish with all the words contained in the crossword. The list contains 2 sets per page for student handouts. This activity makes a great substitute lesson plan because after students complete the crossword, clue translations and image IDs, they can work with partners quizzing each other on Halloween vocabulary from the word list. 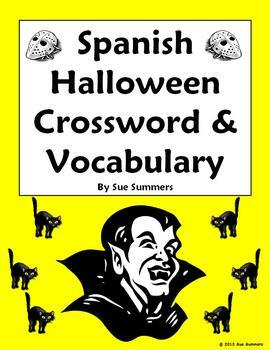 Spanish Halloween Crossword, Image IDs and Vocabulary Reference by Sue Summers is licensed under a Creative Commons Attribution-NonCommercial-NoDerivs 3.0 Unported License.